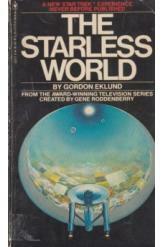 The Starless World by Gordon Eklund, Sci Fi. Book is in good condition, all pages intact. Captain Kirk and the crew of the Enterprise discover a hollow world hurtling toward a black hole. To save it, they must deal with strange nocturnal creatures, klingons, and an alien sun god. A Star Trek novel.